How to watch the Olympics live stream from anywhere in the world. How to watch the Olympics live stream from anywhere in the world? Our guide how to unblock and watch Olympics live stream in the US, UK, Canada, Australia, France, Spain, and around the world. We all know how excited we are during Olympics since we get to watch and cheer our favorite athletes. The interesting part is the competition summons some of the world’s best athletes to one location to identify the best in a series of friendly matchups. 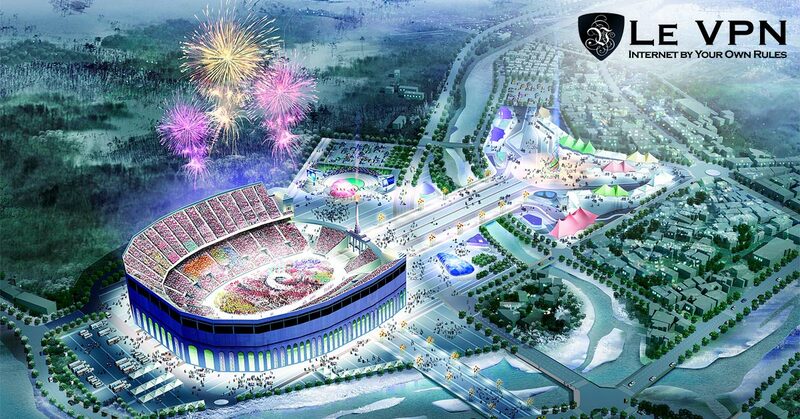 2018 Olympics will take place in PyeongChang, South Korea. With so many contests scheduled to takes place during this period pitting country versus country, it shouldn’t come as a surprise that there are so many ways to watch. The good news is, you can watch the Olympics from the comfort of your home. The bad news is that depending on your location, you might be blocked from live streaming the 2018 Olympics or perhaps be limited to a broadcasting channel you prefer. However, thanks to Virtual Private Network (VPN), you can route your internet session through a VPN server in your location and stream Olympics live. For users’ ease, they can consider selecting Le VPN services for complete security and access to sites like NBC, BBC, CBC, and so on. The Olympics games are the foremost international sporting events that started in ancient Greece. It includes dozens of summer and winter athletic competitions where several athletes across the world participate in a variety of games. The revival of Olympics dates back in 1896, and since then the competition has been staged after every four years, except during World War I and II. The creation of modern Olympics was inspired by the ancient Olympic Games which was a way of saluting the gods, whereas the modern Olympics are a manner of saluting the talents of athletes of all nations. In 1894, the International Olympic Committee (IOC) was founded by Baron de Coubertin, which turned out to be the governing body of Olympic movement to date. The existence of the Olympics movement in the 21st century has resulted in several key changes in the Olympic Games. Major adjustments have been seen in the establishment of the Winter Olympic Games Youth and teenage athletes, ice and winter sports, as well as the Paralympic Games for competitors with a disability. The Mountain cluster – Nordic combined, biathlon, ski jumping, skeleton, snowboarding, luge, alpine skiing, bobsleigh, cross-country skiing, opening and closing ceremonies. The Coastal cluster – curling, short track skating, ice hockey, and speed skating. Four new categories will be added in the Winters Olympics 2018 including mixed alpine skiing, mixed doubles curling, big air snowboarding, and mass start speed skating. We want to make sure you know what Olympics live streaming channel will be broadcasting in your location to ensure you watch the best sporting moments on your screens. Similarly, we will look at some local information on a variety of sports each of the country mentioned bellow will be involved in the Olympics. The United States will take part in the Winter Olympics from 9th to 25th February where it has qualified for several impressive positions including alpine skiing, freestyle skiing, cross-country skiing, Bobsleigh, figure skating, luge, ice hockey, curling, Nordic combined, skeleton, biathlon, short track speed skating, snowboarding, ski jumping, and speed skating. articipating” and will attend. North Korea announced they will participate in the Winter Olympics, so there are talks about a planned Olympic boycott by the US due to the mixed reactions that have been going around between the administration of President Donald Trump and Kim Jong-Un. These concerns were eased when Vice President Pence and his wife Karen confirmed they will attend the Olympics Opening Ceremonies. The good news is, if you are based in the US, NBC has an exclusive contract for Olympics live stream on its official website (NBCOlympics.com) and through the NBC Sports app at no extra cost. Their digital platform will offer more than 1800 hours of a live stream for the Olympics including a variety of events across all 15 sports activities and 102 award events. The live coverage will be accessible on your mobile device, tablets, desktops, and for the first time for Winter Games, on TV. If you prefer to watch the event on your cable TV, a digital antenna will serve you well. There are no delays with this, but it will only feature the broadcast and not the complete set of cable TV channels. NBC Olympic Games will stream live coverage that airs on all the NBCUniversal Olympic networks. Each TV coverage will feature participating athletes, parts of the host’s country, as well as live interviews with medal winners and newsmakers. You will need to connect to a VPN server in the US and get an IP address to access all the above, if you are not located in US and want to use a VPN to stream the Olympics. This will help you watch all the Olympic Games for free, but you will have to cover the VPN charges. All NBC live broadcast will be available throughout the day and primetime as long as you can access the NBC website and NBC sports app. Just like the US, Great Britain will take part in the Winter Olympics from 9th to 25th February. Pyeongchang is 9 hours ahead of GMT, so it’s likely that the thrilling event will happen at night in the United Kingdom. Fans will get to watch competitors participate in a variety of sports including alpine skiing, bobsleigh, biathlon, curling, cross-country skiing, freestyle skiing, figure skating, luge, skeleton, short track speed skating, and snowboarding. In 2014, team Great Britain had an impressive win with four medals under their name. They hope to win more medals this time. Elise Christie who is famous for speedskating brought home three gold medals and a bronze medal during the 2017 World Competitions and hopes to be the first athlete to win several medals in the Winter Olympics 2018. Skeleton gold medalist, Lizzy Yarnold hopes to defend her title at Winter Games. Freestyle skiers Isabel Atkin and James Woods have a great chance to win their first medals on skiing, while snowboarders Billy Morgan and Katie Ormerod could potentially win the women’ curling competition. Will It Be Available On TV In The United Kingdom? Yes, there will be live broadcast and streaming on both BBC and Eurosport. You can watch the best live events of the Winter Olympics from BBC. Although their services are free, you will need a BBC account to gain full access. Once you are logged in, you can enjoy watching from anywhere, either on your tablet, mobile, web browser, gaming console, TV, streaming device, cable, gaming console, or satellite operators. You can also download the BBC iPlayer app on iOS or Android and start watching the event. Eurosport will also provide Olympic Games live stream of all the sports this time. Eurosport won the rights to stream the Olympics across Europe and UK. Unlike BBC which is free, Eurosport requires a paid subscription to gain access. Make sure you’re connected to one of the UK servers first before you start the live stream. You can also download the Eurosport app and enjoy the Winter Games. France plans to take part in the 2018 Winter Olympics from 9th to 28th February. However, France’s sports minister has indicated that the French Olympics team will skip the 2018 Winter Games if its security cannot be guaranteed. This is because of the tension in the region since North Korea conducted it’s sixth and the largest nuclear test on 3rd September that has received global condemnation. She indicated that security is their number one priority and if it cannot be assured, the team will stay home. But she indicated they are not there yet. The France Olympic team hopes to take part in alpine skiing, cross-country skiing, bobsleigh, freestyle skiing, biathlon, ski jumping, Nordic combined, snowboarding, figure skating, short track speed skating, and speed skating. For those in France wondering how you can watch the Winter Games, the France.TV is your best option. The International Olympic Committee (IOC) awarded the France.TV the exclusive rights for the live broadcast for XXII Olympic Games in Sochi (2014), Russia, XXXI Olympiad 2016 in Rio De Janeiro, Brazil, and 2018 Olympic Games. This partnership allows France.TV to broadcast the Winter Olympics Games with the widest coverage on all media platforms. 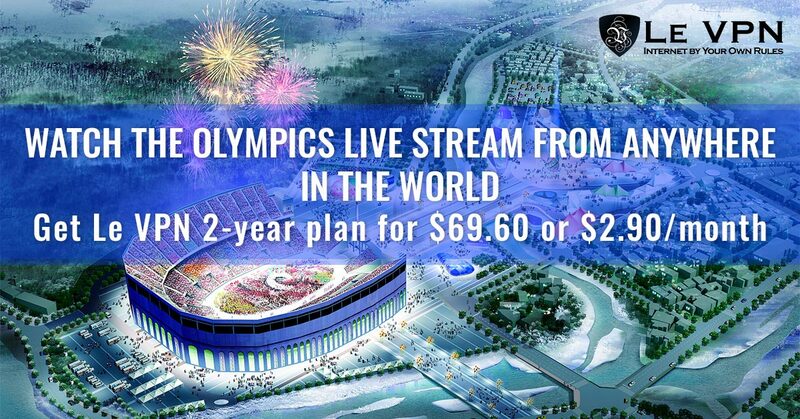 It will also provide unlimited free-to-air air time, and Olympics games live streaming on all websites and mobile platform. Anyone located outside France may find the content blocked, but with a VPN and our Le VPN server in France, you will be able to access live streams across the globe even from restricted locations. This means you can be anywhere in the world and connect to the French server to enjoy the French commentators and live streaming of the Winter Olympics events targeted to the French audience. Canada plans to compete at the Winter Olympics 2018, from 9th to 25th February. This will be the 23rd appearance at the Olympics games event since their inauguration in 1924. On January 2018, it was announced that figure scatters Scott Moir and Tessa Virtue will be the country’s flag bearers in this year’s Olympics ceremony. This will be the first time Canada will have two athletes as flag bearers. Canada’s Olympic Broadcast Media Consortium, a joint venture between Bell Media and Rogers Media were granted the rights to broadcast the 2010 and 2012 Olympics. In 2014, CBC announced that it had extended its right to broadcast Olympics through 2020 to provide distribution coverage in conjunction with the TSN networks. Canada will take part in all games except Nordic combined. If you are living in Canada and want to enjoy the latest events of Winter Olympics 2018, you need to stream CBC. It will cover every medal winning event through their official website or via the CBC app. CBC Canada is proud to be part of Canada’s Olympic Network in 2018 all through to 2024 to provide Canadians with the highest level of live coverage during the Olympics Winter Games in Pyeongchang. Telelatino Network (TLN), a Canadian media company has also finalized a good deal with CBC to secure rights to broadcast the next Winter Olympic Games. TLN will provide Spanish and Italian coverage of the Winter Games in PyeongChang and the 2020 Summer Olympics in Tokyo, Japan. Fans will be able to access one game per day from this network along with daily broadcast and highlights of these games. TLN coverage is set to begin on 10th February with a live broadcast of the women’s ice hockey game between Japan and South Korea. Australia will be among the nations competing at the Winter Olympics in PyeongChang from 9th to 25th February 2018. A team of 45 athletes including Belle Brockhoff and Rusell Henshaw was announced by the Australian Olympic Committee on 25th January 2018. An additional five athletes were added to the list after the process of relocation of quota spots was concluded. Australia will take part in alpine skiing, bobsleigh, figure skating, luge, cross-country skiing, short track speed skating, freestyle skiing, snowboarding, skeleton, and speed skating sports. For those Australian fans who may want to enjoy watching the Olympics Games, Seven Network will be the best option. Seven Network is an Australian free-to-air television network owned by Seven West Media. Seven provided a live broadcast of Rio Olympics in Brazil. It has announced it will offer a paid subscription service through its app as part of the Olympic live broadcast this year. This subscription service is expected to broadcast over 1000 hours of free content during the Winter Olympics. This service will allow the sports fanatics to watch their favorite games from the beginning to the end. Apart from having full rights to broadcast 2018 Winter Olympic Games in PyeongChang, it will also be part of the 2020 Olympic Games in Tokyo. If you discover you’ve been locked out of the streaming service just because you’re not from Australia, you can get around the restrictions with Le VPN, to unlock any live streaming you want. Spain will also compete at the Winter Olympics from 9th to 25th February 2018. It has qualified for different categories including alpine skiing, figure skating, cross-country skiing, skeleton, and snowboarding. Spain has always excelled in skating and this year is no different since Javier Fernandez Lopez who spots five European and two world figure skating titles under his name will be part of the much-contested competition. For those who want to watch live Olympic events in Spain, you might need to tune in to RTVE and enjoy watching all the events. RTVE was founded in the 50’s, and it has incorporated a lot of new channels with time. They feature a 24-hour news channel, an international TV channel, children channel, and La 1 and La 2 which are popular TV channels. You can enjoy live streams of La 1, La 2, 24H (news channel), and TDP (Teledeporte). The live stream will allow residents to watch the Winter Games at the comfort of their home. Although it’s a great offer, unfortunately, a lot of these channels are not accessible to viewers who want to watch from abroad. Luckily there is an easy way to solve this using a VPN. Le VPN is a perfect app to use to bypass geographic restrictions. The VPN will connect you to one of the servers in Spain and provide you with a Spanish IP address. With access to this, you can visit their website and watch all the shows and stream the Olympic Games lives as if you were in Spain. On 5th December 2017, the IOC indicated that Russian Olympic Committee had been suspended immediately from participating in the 2018 Winter Olympics. Only the athletes with zero drug violations and those with a history of drug testing were allowed to take part in the Olympics. Nineteen anti-doping organisations supported the suspension of Russia from competing in all sports. It was suspended from athletics, Paralympic sports, and weightlifting, but it has continued competing in other sports. There have been calls to impose a complete ban on Russia from competing in the 2018 Winter Olympics or allow Russian athletes to participate as neutrals only. As a final note, the 23rd Olympic Winter Games will be another huge event you can expect to see this year, apart from the World Cup. The interesting part is that it will be easier to access live streaming of the entire event to keep you updated. You can do this using a VPN to tackle online censorship issues and geo-restriction easily. This will ensure you enjoy watching your favorite sporting events whenever you want. Grab Le VPN special offer for the Olympic Games streaming: over 40% OFF on regular yearly plans for a 2-year deal for only $69.60 or only $2.90 per month! Get it now and let the fun of Winter Olympic Games begin! Your article helped me stream the Olympics this last winter. Any plans on doing a similar post for the World Cup?